The Polish actress Helena Modjeska, for whom an Orange County street, park and canyon is named, was also an author and artist. 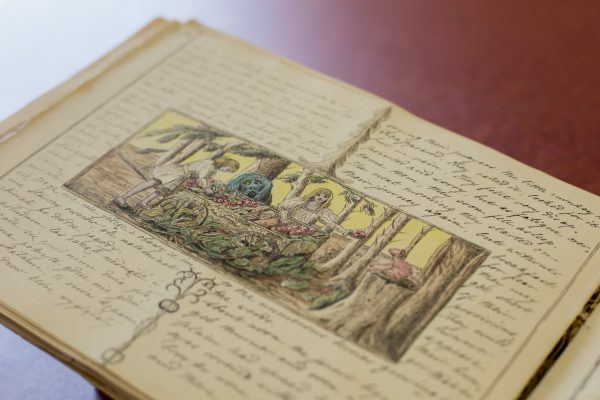 Laguna Art Museum is currently displaying the original manuscript of “Titi, Nunu, and Klembolo,” a fairy tale written and illustrated by Modjeska and presented as a gift to her grandson Felix Modjeski in1896. Pages from Helena Modjeska’s fairy tale book. Photo by Allan Helmick. Dr. Maja Trochimczyk, president of the Helena Modjeska Art and Culture Club, is a Californian music historian, writer and poet of Polish descent who last week gave a talk at LAM on the author and actress’s prolific and colorful life. Modjeska was born Jadwiga Benda in Krakow, Poland in 1840. Her mother was a widow and it was rumored thatPrince Wladyslaw Sanguszko illegitimately fathered her. She was baptized as Helena Opid, taking the last name of her music teacher/godfatherwhoseliterary and artistic friends influenced the family. Gustave Sinnmayer Modrzejewski (1825-1901) a theater director, actor and manager of an acting troupe, supervised her early education and promoted her fledgling acting career. Although he was 20 years her senior and they were not married, they lived together and had two children: a son, Rudolf (1861-1940) later known as Ralph Modjeski, who became a civil engineer in the United States, and a daughter who died as a baby. Sinnmayer used the name “Modrzejewski” on stage. Helena adopted the feminine version, “Modrzejewska” as her stage name. In 1861 she made her first appearance on stage in a one-act comedy. 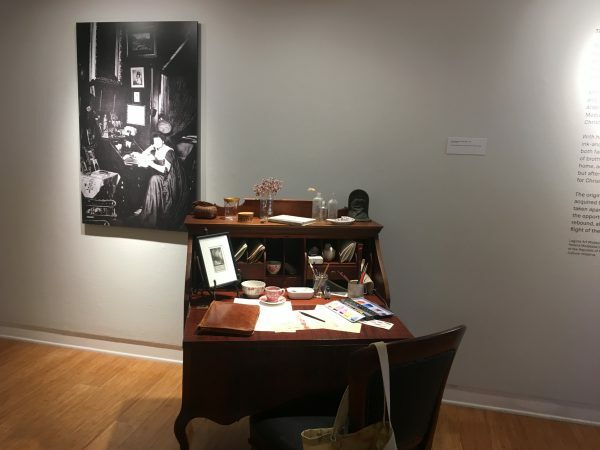 Along with folios, tilted up at the perfect angle to inspect the currently un-bound pages of “Titi, Nunu, and Klembolo,” is the writing desk that Modjeska used in her Orange County home called Arden. It was on a visit to Arden, now a historical landmark located between Santiago and Trabuco Canyons, that LAM’s executive director Malcolm Warner first saw reproductions of “Titi, Nunu, and Klembolo.” The 147-page book, hand-written in Polish and English, is illustrated with intricate ink and watercolor drawings and designs on every page. “This is the first time the public has been able to see Modjeska’s fantastic illustrated story like this—normally it’s bound as a book and only one double-page spread can be displayed at a time,” Warner said. Learning that the UC Irvine library had acquired the book, Warner contacted friends there and discovered that the library had received the manuscript from the City Museum of New York and was preparing to send it to the UCLA Library Conservation Center for conservation/preservation treatment, rebinding and digitization. 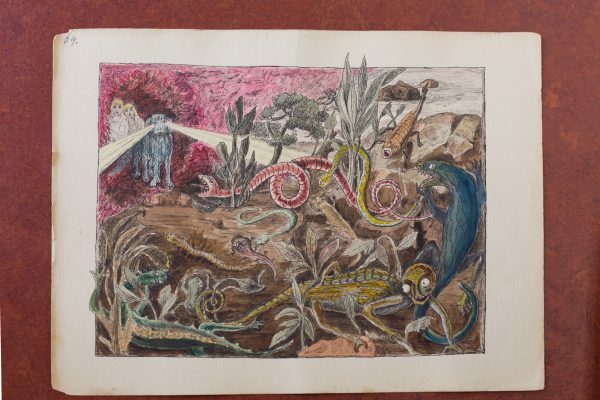 “Prior to rebinding the book and in consultation with the Conservation Center, we agreed to display the book at the Laguna Art Museum through May 27,” said Lorelei Tanji, UCI’s university librarian. 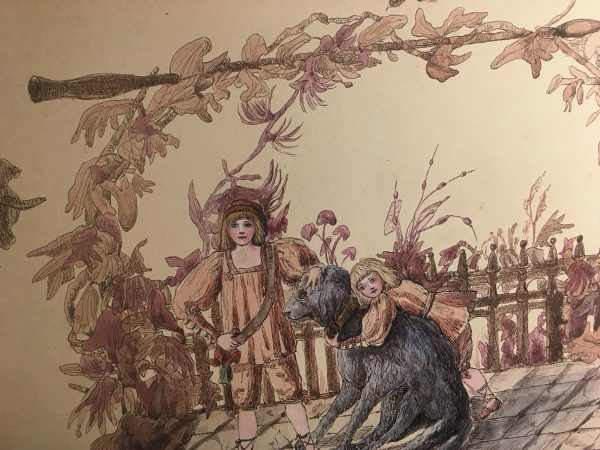 Titi and Nunu hug their dog, Klembolo, as illustrated in Helena Modjeska’s Fairy Tale Book. Photo by Allan Helmick. Titi and Nunu are brothers, ages 7 and 8, who live on Mars with their six-legged blue dog named Klembolo. “People come in many colors too and there are blotchy, sharp-toothed monsters who kill wicked children and eat them,” the card opposite the brightly colored illustrated first pages says. Although Modjeska’s tale is filled with evil sprits, giant snakes and lizards, and dreadful child eaters, it is not one of fear and punishment like the Grimm Brother’s stories written earlier in the century. The themes in Modjeska’s story are brotherly love, kindness and repentance, and virtue as reward. “Also, your dog is your best friend,” Trochimczyk said. When a huge, blue butterfly lands in Titi and Nunu’s honey dish and gets stuck, they argue over it and end up pulling it apart. A horrible fight ensues, induced by an evil sprit, and as a result, the boys’ skin changes from pink to lilac. They decide to take Klembolo and the dogcart to search for a magical spring that restores people to their natural colors. Modjeska and her husband briefly traveled to Krakow, where Chlapowski published a partisan journal and where she became somewhat active in Polish politics. Upon return to Warsaw, the radical nationalist position held by both Modrzejewska and Chlapowski resulted in increasing harassment by Russian authorities. In 1876, Modjeska and her husband embarked on a search of their own, for a more bucolic life and an escape from Russian persecution. Within two years, they, along with other like-minded friends, purchased a ranch in Anaheim, California, where they commenced an experiment in communal living, trying their hand at raising cattle, and growing oranges and olives. Their utopian experiment failed due to a drought and their lack of farming experience. The couple sold the ranch and purchased the home known as Arden, a four-hour ride by horse cart, in what is now Modjeska Canyon. Returning to acting, Modjeska made her U.S. debut in San Francisco, Boston, New York and Washington D.C. in 1877. It was then that she shortened her name to Modjeska, making it easier for her American audiences to pronounce. For these performances she also served as costume-maker, producer, manager and publicist. In 1878, she mounted shows in London and Paris. In 1883, she became a U.S. citizen and made a professional tour of Poland and England during 1884–85. At the 1893 Columbian Exposition in Chicago, she delivered a stirring speech, Matka Polka (Mother Poland),on the status of Polish women, uttering several highly patriotic remarks regarding the injustice of Poland’s 18th century partitions. In Russia, her speech met with the ire of tsarist authorities, who forbade her from ever returning to Russian Poland. Titi and Nunu’s dog, Klembolo, shoots beams of light from his eyes to chase off fearsome creatures.Photo by Allan Helmick. Titi and Nunu, still searching for the spring, become more discolored when their family despairs, realizing they’re missing, and their grandmother dies. Klembolo chases off fearsome creatures along the way by shooting intense beams of light at them from his eyes. A two-headed giant rescues the boys from another peril, but later they must escape after he imprisons them. 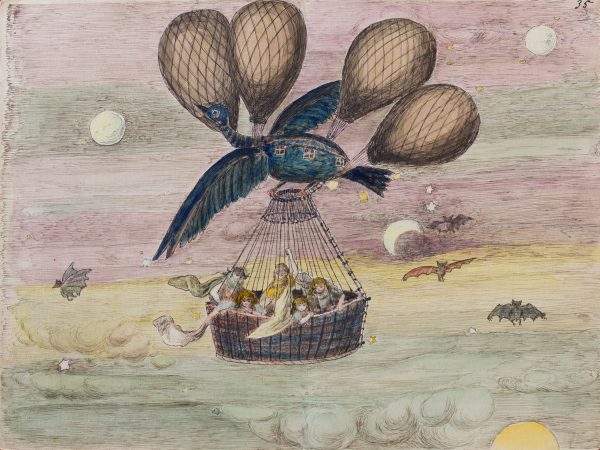 Helena Modjeska’s illustration of Titi, Nunu, and their little sister riding with the “sacred maidens” in an airship powered by an aluminum bird. Photo by allan Helmick. “Sacred maidens” eventually rescue Titi, Nunu and a pink monkey they befriend and name Krikri. The maidens explain that only true repentance, and not the spring, will restore their natural coloring. An aerial boat takes the boys back to their family, where they confess their sins and are forgiven by their father. Their sister, Sylia, tells them their grandmother Marmora was transformed in death into a tree. Nunu gives the pink monkey, Krikri, to his sister as a gift. It is Christmas Eve, and the boys fall asleep under the watch of a guardian angel. In America, Modjeska was best known for her portrayal of several Shakespearean roles, including Juliet, Desdemona, Rosalind, Queen Anne, and Ophelia. She played Juliet until she was 47 years old; but her longest-performed Shakespearean role was of Lady Macbeth that she performed fragments of in various appearances even after her official retirement from the stage. After 20 years at Arden, Modjeska and her husband moved to Newport Beach, where the actress died in 1909. Chlapowski returned to Poland and buried her remains in Krakow. Tanji, the UCI librarian, said the idea of a facsimile copyof the book is under consideration. “At this point, I can’t say for sure yet that we have any plans,” she said. 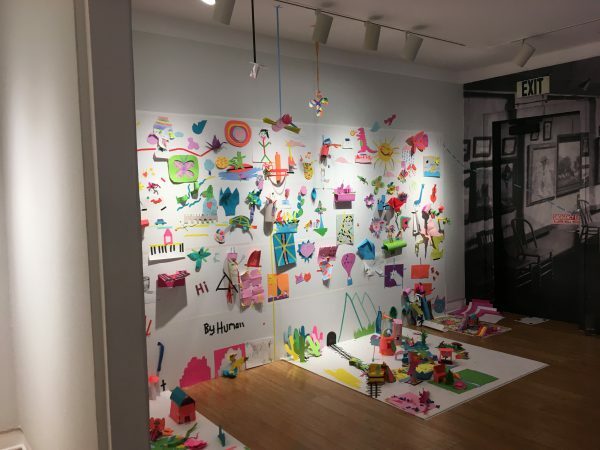 For families inspired by this fairy tale,the LAM + LAB offers hands-on art-making opportunities Saturdays from 11 a.m. to 2 p.m. The exhibit runs through May 27. Some photos in a previous version of this article were incorrectly attributed to UCI special collections. They were taken by Allan Helmick .